At this point I get it, you guys are sitting there, pretty much just thinking, release the benchmarks already! I mean we’ve known about Ryzen Threadripper for some time now, but AMD seems hell bent on spoon feeding us information (Radeon Vega specs are out now, too). This really started at Computex, we were wowed by a few menacing looking X399 motherboards and AMD announced that the CPUs would pack an impressive 64 PCIe lanes. We also knew there would be an 16-core/32-thread model and that quad channel DDR4 memory would be supported. 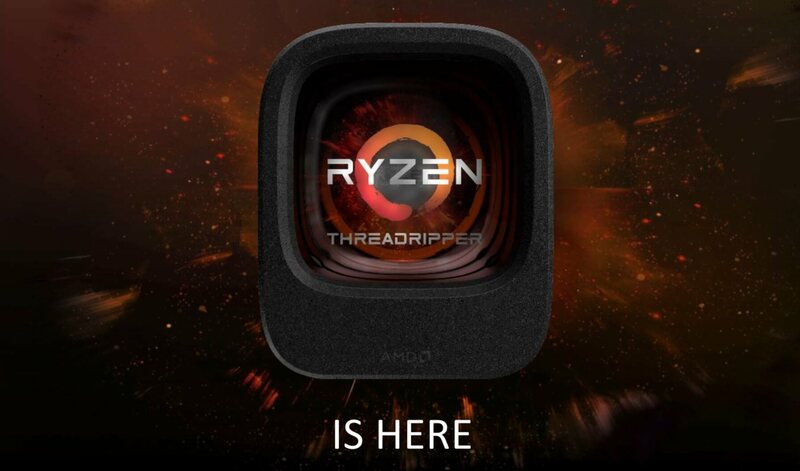 Then more recently AMD released details regarding the models we now know as Threadripper 1950X and 1920X. Today AMD is letting a few more details out of the bag, and thankfully we can tell you that our full review of Ryzen Threadripper is coming this August 10th. For now, let’s go over the information AMD released over the weekend at SIGGRAPH. AMD is proud in saying Ryzen has seen a return to innovation for high-performance PCs. It has certainly allowed the company to increase their research and development budget which will see innovation continue and likely at a faster rate. They also say Ryzen has injected excitement back into PCs and I fully agree, it’s nice being able to review CPUs again rather than just recommend whatever it is the blue team's doing. If you were wondering about mobile Ryzen, AMD's full Ryzen roadmap is below and we can see that once AMD executes their Threadripper launch next week all attention will turn to the mobile APUs in Q4. I’m also very keen to check out the desktop APUs but presumably they won’t be arriving until 2018. I thought we were going with SHED ‘Super High-End Desktop’ but so far I’ve only seen AMD refer to the extreme desktop platform as HEDT which stands for High-end Desktop. So we know Threadripper is a high-end desktop platform offering greater memory support and bandwidth along with vastly superior connectivity and expansion thanks to all those PCIe lanes. We also know when compared to Intel’s Core-X range, Threadripper will be very competitive in terms of pricing. We even know it will come in a fancy package. Moving on nothing really new was said about the 1950X or 1920X, though AMD did release a few slides that show the kind performance gains consumers can expect to see over the competing Intel parts in applications such as POVRay, Premiere Pro, HandBrake, 7-Zip and Veracrypt. Based on the numbers seen here the 1950X will have the Core i9-7900X truly beaten, so it will be interesting to see how they compare in our review on the 10th. Meanwhile it looks like the 1920X will deliver similar performance to the 7900X at a 20% price saving. The new CPU to get announced is the Threadripper 1900X. This is basically a Ryzen 7 CPU for the X399 platform, but with a few key upgrades. Like the 1920X and 1950X the 1900X gets quad-channel memory support and crucially 64 PCIe lanes. Like Ryzen 7, it will boast 8-core/16-threads and operate at a base clocked speed of 3.8 GHz with a 4 GHz boost speed. It will come in at $550, which is quite a hefty premium over the base Ryzen 7 1700, but again you get it on AMD’s flagship platform. When compared on paper to the Core i7-7820X, the 1900X offers the same amount of cores and threads, 5% more cache, the same quad-channel memory support, but more than twice as many PCIe lanes. It’s also likely to cost around 10% less given the suggested retail price. AMD is willing to show their superior performance per watt based on Blender results. Based on their own testing the 1950X was 24% faster than the Core i9-7900X while drawing 2% less power from the wall, presumably they used the same power supply for both systems. There is said to be a full ecosystem of X399 motherboards at launch and I should have models from Asrock, Gigabyte and MSI for day one coverage. There will also be a range of 180w liquid and air-cooled cooling solutions to choose from and it looks like existing coolers can be adapted to the massive Threadripper CPUs using an AM4 to TR4 adapter which has been manufactured by Asetek and will be supplied with the Threadripper CPUs. Presumably though for the best results you will want a large base plate on the cooler. Speaking of size, some interesting information surfaced this week. The Threadripper CPUs actually have four physical dies, though I had assumed this was the case given the evidence at hand, it’s now been confirmed. Like EPYC, Threadripper uses the TR4 socket and this means the CPU has the same incredible 4094-pins. So basically Threadripper is an EPYC CPU with two of the Zeppelin dies disabled, kind of like what the Ryzen 5 1400 is to the Ryzen 7 1700, for example. Finally, at the weekend event AMD had a live Threadripper overclocking demo where they hit 5.2 GHz using LN2 and broke the Cinebench R15 world record with a score of 4122 pts, not bad. Of course, on air or liquid I expect similar headroom to what we’ve already seen with Ryzen 7.